There’s no denying it – I’m addicted to Instagram food posts. It’s like a little window to the world I can hold in the palm of my hand. 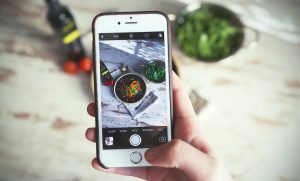 One of the hottest sources of inspiration for my food choices and recipes comes from Instagram. Like a lot of people, I’m always thinking about, “What am I going to eat next?” “Where am I going to dine next?”, “What’s in the fridge and what can I pull together for dinner?” @OUKosher is a great resource for Kosher foods and recipes that are trending, and helps me decide what to I’m going to eat and serve my family. Instagram has changed the way I eat and view food. How many times have you sat at a restaurant, only to see someone at another table excitedly snapping a photo of their plate before digging in? How many times have you been that person? I know I have! I love food photography because I love to look at food. The saying “we eat with our eyes” rings truer than ever and Kosher consumers are no different. Believe it or not, some researchers have even suggested that snapping a photo of your food before taking that first bite can improve the taste! That latest OU Kosher certified plant based snack – yup – you’ll find it on @OUKosher. Looking for a great Kosher Smoothie Bowl, look no further, it’s on @OUKosher. Searching for the latest OU Kosher trends, right again, it’s on @OUKosher. With close to 1 million OU Kosher certified products worldwide, chances are that meal you’re preparing right now or dining on has dozens of OU Kosher certified ingredients in it. Instantly recognizable, the OU Kosher symbol transforms any food or meal to the highest level of trust and reliability. So remember, the next time you’re out food shopping, dining or preparing a meal, look for the OU Kosher symbol and snap away – just remember to #OUKosher!